Great choice of genre, but even more, a great choice of selections within the genre. Some very familiar, others new. Your enunciation, your variety of volumes, your tone was spot on. I thought the music did a great job of bringing to life the people as well as the music of Appalachia. And the concert attire....loved it! Your enjoyment added to the enjoyment of the audience. Thank you for brightening such a gloomy afternoon! We very much enjoyed all the authentic Appalachian music -- especially the history behind so many of the works. It was a great program, sung with excellent energy and enthusiasm. I especially enjoyed the contrast of solo pieces with ensemble works, as well as the flairs of drama brought to life. I was particularly impressed with the diction. I could understand every word. I don't like to follow along in programs because I like to see the singers' faces and the conductor's arms – so I was very happy that I understood every word. Since I watched the singers – it was evident they were enjoying it. That concert just fit that group perfectly! That was one of the most enjoyable ACS concerts I can remember! Delightfully varied repertoire, humorous, enlightening commentary from the maestro. Crisp, balanced sound, no part overwhelming another, good balance. Great selection of pieces. The blend and tone were wonderful. The concert was beautiful....loved the selections. Thanks to all of you talented singers and to Kevin for always coming up with a new theme.....difficult music!!! People liked the variety of pieces and the alternation of vocal and instrumental pieces. The recorders, flute, drum and piano were great. I wanted to congratulate everyone with such a successful, wonderful concert. ESPECIALLY, with all the Russian songs. I know learning Russian was not easy; but you all did it. It sounded so authentic, fluent, and so Russian!!! The choir sounds really professional. 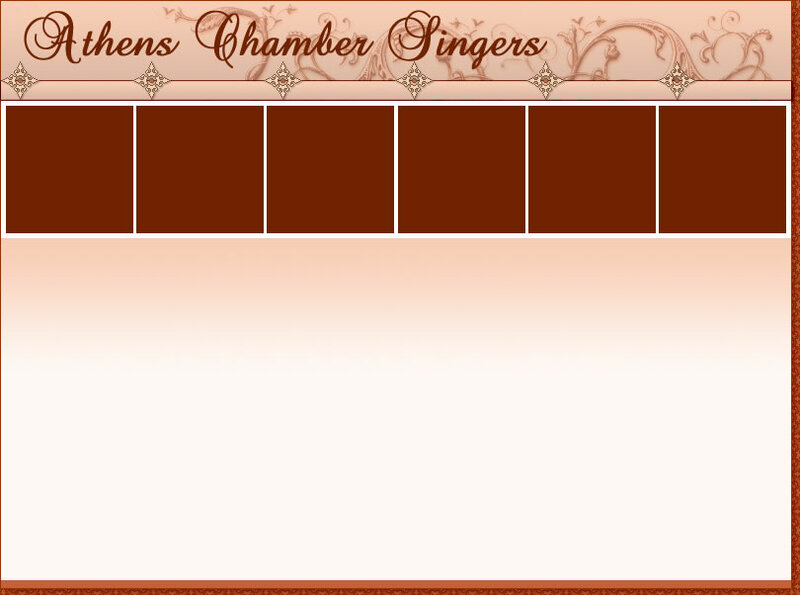 I wanted to tell you how much I enjoyed the Athens Chamber Singers concert on Sunday. It was wonderful. When it was over, I couldn't help but think "is that all?" and alas it was. As usual, everything was done so very well. Yuledinners 2015: "A Child's Christmas"
I appreciate that you came to the Canadian’s table to sing the tobogganing song (“Run, Tobaggan, Run”). I had a GREAT toboggan as a kid. So there were many warm childhood memories there for me. That piece had some rather tricky but attractive harmonic twists in it that I thought you all negotiated very smoothly! I am always amazed how you get a lush, full sound from a small group. Also, since the group is comprised of so many singers who are solo capable, it can be difficult to keep them under control within a group, but you did it! It was nice to let so many of them loose on the last singers’ number (“Children, Go Where I Send Thee”), which was my favorite piece. Great performance last night; inspirational, as always! All of the words were clear. Most of the songs were new to the listeners, an aspect that is a hallmark of the Chamber Singers’ repertoire. Roar! Meow! Arf! Tweet! Ribbet! No matter what the language, the concert yesterday was totally engaging and delightful! To see such accomplished musicians letting their 'wild' side show was just wonderful! Thank you to all who participated....you had the audience captivated. Great job! The Awesome Animals were AWESOME! We loved it all - the music, singing and especially the enthusiasm from everyone! Thanks for all of the great music! Congratulations for planning such an engaging and creative program. Everything from the music selection to the decor was fun! Congrats on your wonderful concert Sunday. I really enjoyed it (as indeed the entire audience did)! The stuffed animals were great and added just the right touch. The choir must have loved all the pieces too, they seemed to have as much fun as their audience. Thank you. Good company enjoying good food and delightful surroundings. The selection of music was delightful, the soloists outstanding. You can tell the group has sung together a long time. The blend was just beautiful, particularly on “Iona." I’m doing a bible study about Bethlehem right now and so many of your selections had extra meaning to me. This is our soul music.